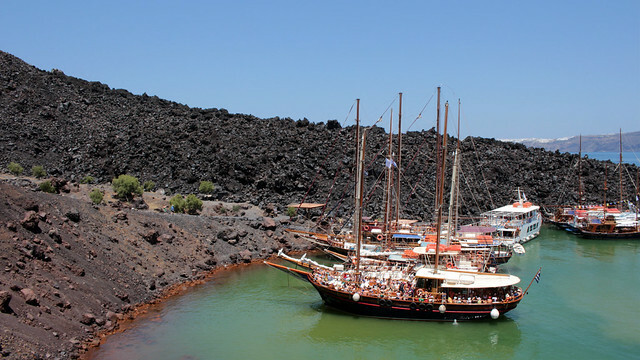 The bus eventually picked us up just shy of noon and by 12.30pm, we were at last on our way aboard a boat to Nea Kameni, which last erupted in 1950. 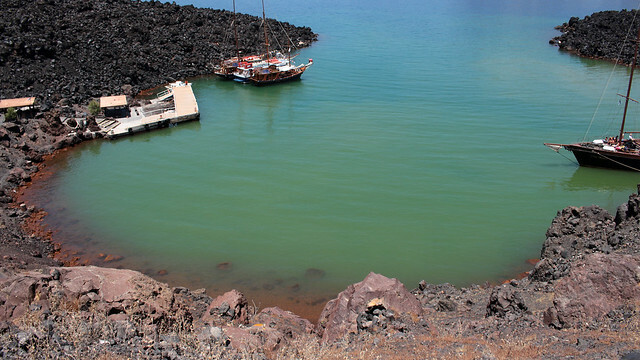 The journey between the port and the volcanic island wasn’t long, about half an hour. On arrival, before we could really start wandering around, a €2 entry charge is payable to the authority that manages this geological park. You get a fairly informative brochure in return. 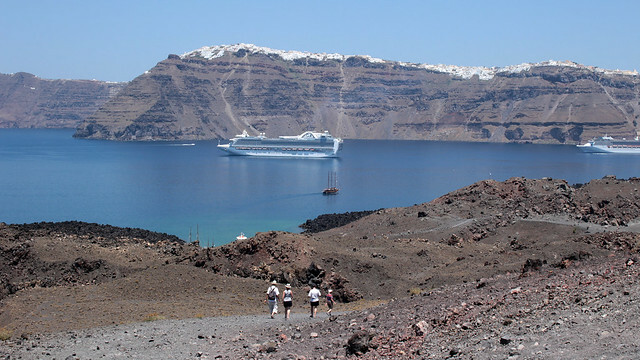 Our guide was a friendly Russian polyglot who called everyone her “babies” (cute, but disturbing at the same time), hike the volcano on a nearly daily basis, and certainly have a story or two about the volcanic past and present of Santorini to tell the group. 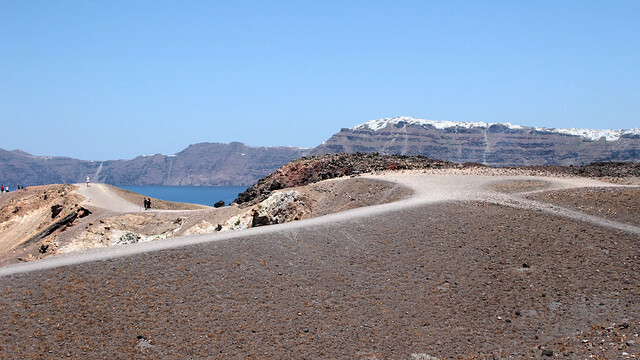 We learned about the formation of Santorini and its caldera, results of multiple eruptions – at least 12 – in the last few millenia. However, enthusiastic as she was, I found some of her narrative lacking and started searching for more information myself. I know, I’m a bit of a nerd sometimes. 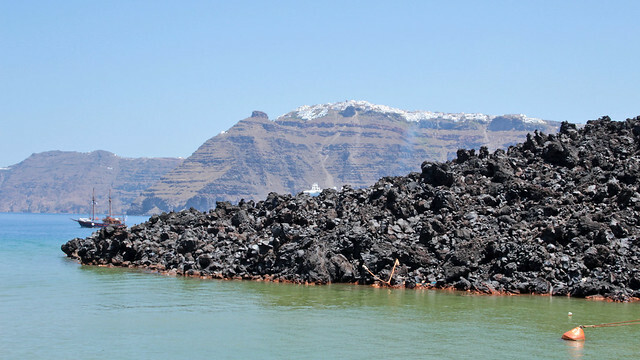 What is commonly known as “volcano” today refers to Nea Kameni, the youngest addition to the caldera, having formed only in the 18th century practically overnight according to eyewitness’ accounts. 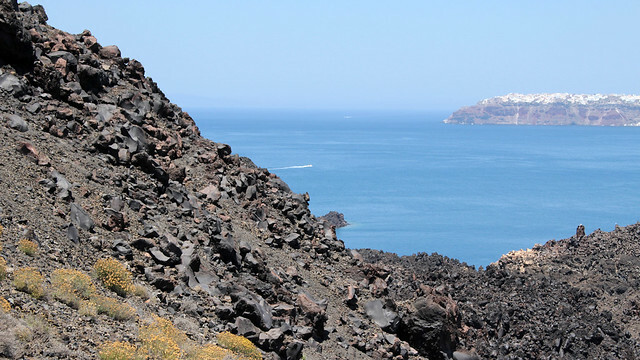 The few eruptions that followed added the land mass of the island, merging it with another volcanic island known as Mikri Kameni, and reinforcing its growth. 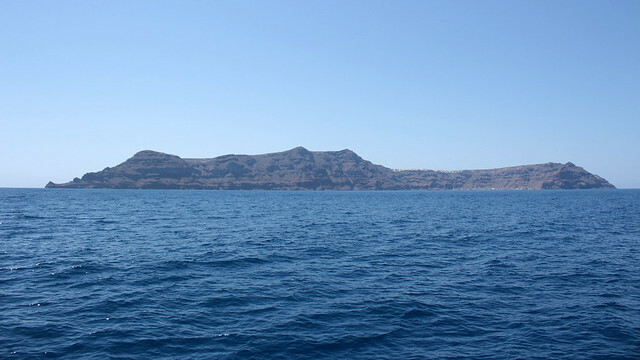 To its west is an older “burnt rock” of Palea Kameni. 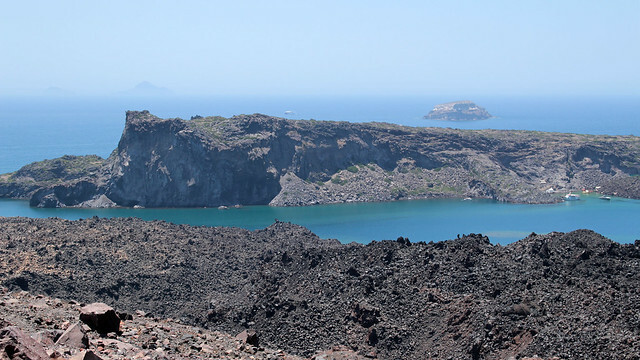 This PDF shows the timeline and various phases of the appearance of these two volcanic islands. 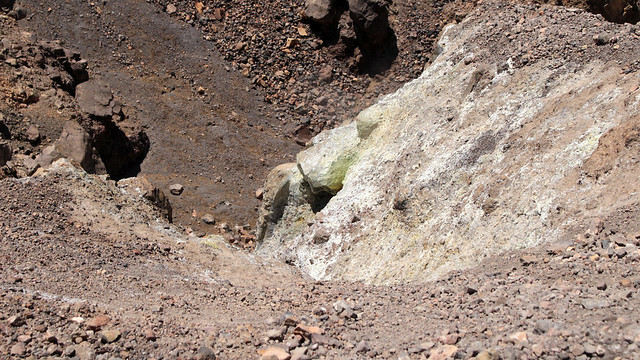 In recent years, Nea Kameni had been changing its form (albeit minute movements that cannot be discerned by eyes), and it is being closely monitored in case of increasing activities. As it is, it emits steam and sulfur on small but steady stream (scientifically classified as fumoroles) and there are a number of hot springs around the island. 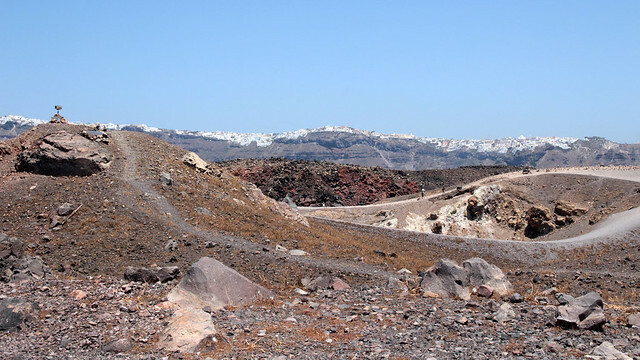 For now though, it is still safe to visit, walk about to observe the various craters from past eruptions, and enjoy the view of the cliff-villages facing the caldera, Thirassia, Palea Kameni, and Aspronisi. 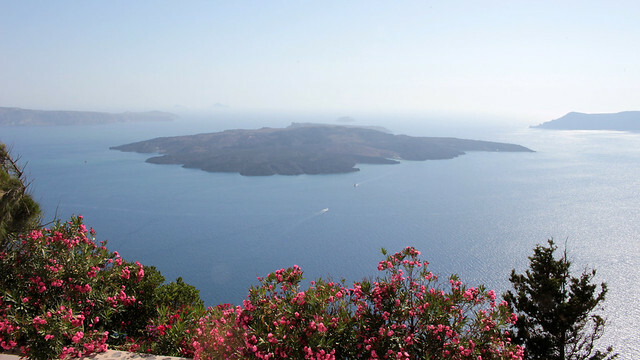 On a clear day, the islands of Christiana and Askania further out in the Sea of Crete can be spotted. Swimming at the hot spring is also part of our tour. 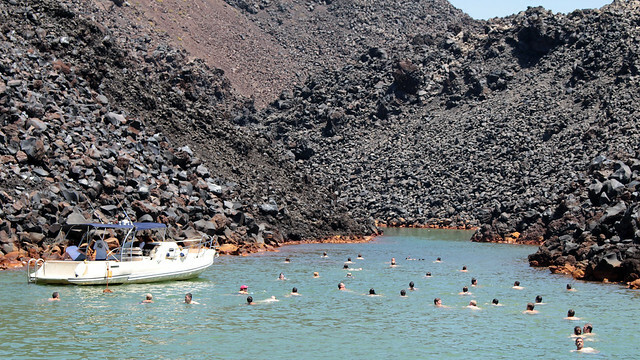 With our boat anchored not far from the bay leading into the hot spring, swimmers were to climb down/jump off from the boat and swim their way over. The water temperature changes gradually and F, who is ever curious about what lies in the water, even went in with his mask and scuba. Visibility was, as expected, very poor and there were no fish to be spotted anyway. He did came back with “souvenir” – sulphur deposit on him (less obvious), under his nails (orange!) and on his mask and scuba (the discoloration is still there). 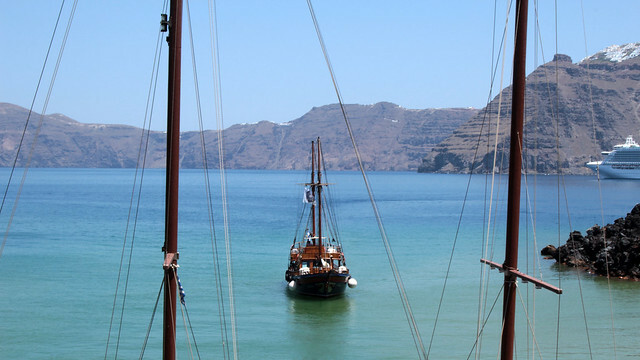 After leaving the hot spring, our next destination was Thirassia, the second largest island of the group of Santorini archipelago. 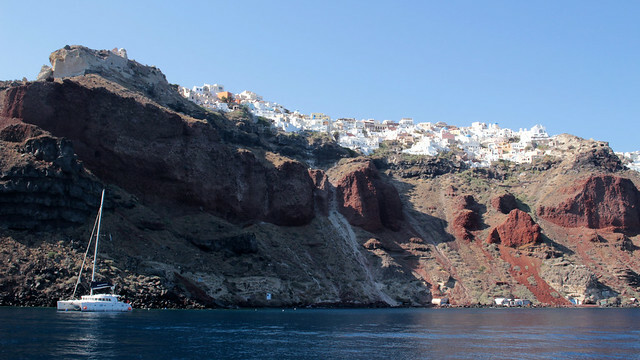 It became separated from Thira (the main island of Santorini) during the Minoan eruption and our guide helpfully pointed out the alligator’s head shape of the southern part of the island. We didn’t have much time to actually see Thirassia, no thanks to the late start in the morning that was not compensated, not even time-wise. We had a little over an hour to eat grab a late lunch, or to walk up and back down again to the main settlement above the port. We prioritised on food, followed by a short dip in the water, before getting back on the boat again. 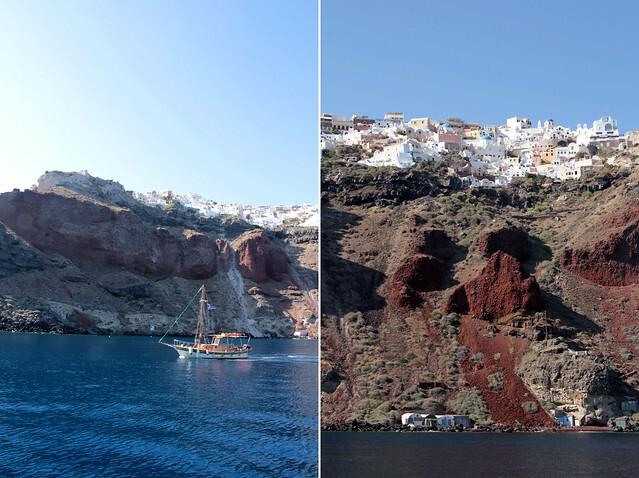 We had a short sailing time underneath the cliffs of Oia, admiring the white-washed cave houses and buildings that created a snowcap-like effect on the darker volcanic foundations. 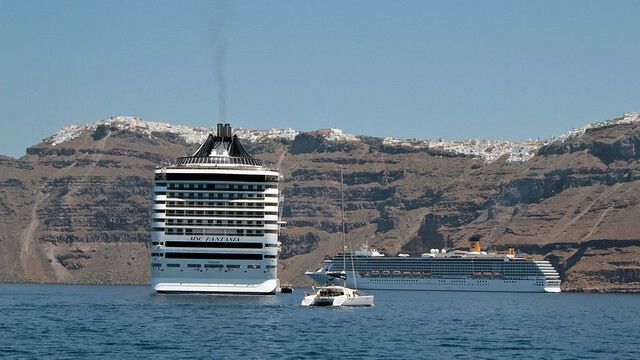 The boat eventually docked at the Armeni Bay and we decided to get off here and return to Oia directly. 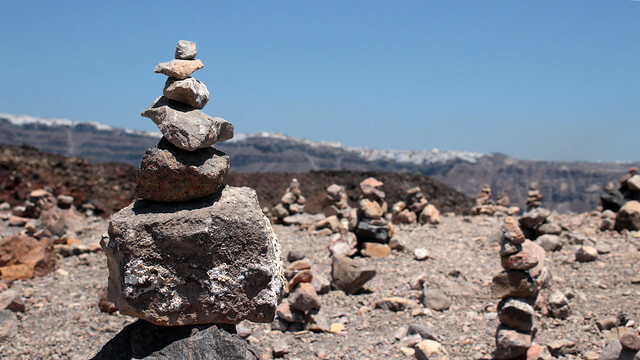 There are a couple of options to ascend to Oia – by foot or by donkey. F decided to walk up while I opted to try the donkey ride. It was an once-off experience I do not care to repeat. It was enjoyable enough, but I would prefer to ascend at my own speed, have some time to take in the view and photograph the landscape. Instead, I was on a rather bumpy ride on a donkey that tried to overtake its friends on a regular basis then getting swatted by those unwilling to make way (ouch, I got whipped by donkey’s tail! 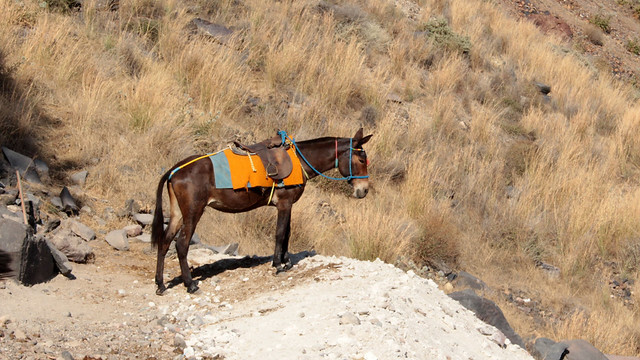 ), squeezing tight against rock walls (I had work cut out to make sure my legs were not grazed by these jagged stones), and the ride ended nowhere near the top of the steps. It was still a good walk up myself in the end. We certainly can’t label the day as unadventurous. 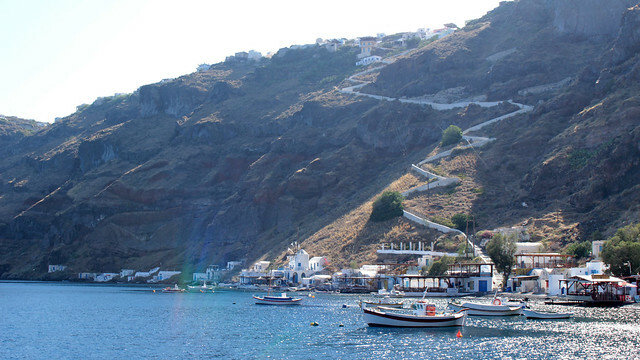 We learned to temper our patience to the island hours, cruised in a caldera, hiked an active volcano, swam in sulphurous hot spring (well, F did), learned some new things, met a few interesting people, rode a donkey (well, I did), and more importantly, fell further in love with Santorini despite the high tourist population. It was Day 2 and already we felt like we could live here for a long, long time. nice! shame about the tardiness. 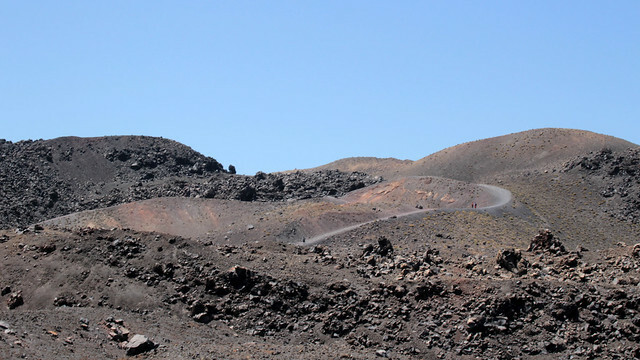 in hawaii, local legend says do not take any volcanic rock away from the volcano or tragedy will befall you. do the greeks have the same beliefs? hmmm none was mentioned but in general I don’t take away rocks from natural sites, not even at beaches, since they often act as protective layer. i know one stones or pebbles may not seem much, but if everyone take just one away with them, it’ll be stripped of the layer very quickly! with volcano, especially one that’s still active, who knows if taking one particular rock may open up an unexpected steam vent or something?